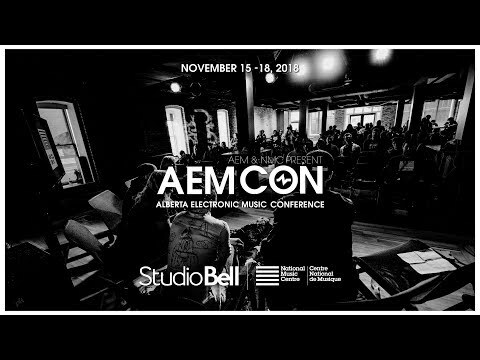 If you do anything this week in Calgary, it should involve making your way to AEMCON aka Alberta Electronic Music Conference. November 15th-18th 2018 , AEMCON will take over Calgary's music scene and it is about to be inspiring, motivating and intense. AEMCON and its partners The National Music Center have a mission and it is big. They wish to bring people together to connect, learn, lead and build through Canada's electronic music scene. For AEMCONs third year, were exploring the many ways that artists and electronic music professionals can make their way in the modern economy. From scoring video games and creating Youtube channels, to touring internationally or producing festivals, there are many ways for people to make their way. Weve assembled some of the worlds best at this conference to teach you how they forged their path." Whether you are an industry professional, a new artist or perhaps just interested in the music scene altogether, AEMCON is the place to be this week. Returning for its third year Alberta Electronic Music and The National Music Center have worked hard to offer attendees four days of learning, sharing and networking, along with performances by 40+ artists at multiple venues in the city. Catch panels of speakers such as multi Juno Award winners and activists, A Tribe Called Red, PK Sounds Senior Vice President, Arlen Cormack, Chris Goss; Co-founder of the world-renowned drum and bass label, Hospital Records. As well as teachers providing keynotes and workshops in music tech, streaming, PR, marketing, financial opportunities, songwriting, expressing creativity and much more. Hands-on learning and lessons form key industry players will help shape your music career, learn new ways to lead your music team, find new opportunities in the music world and help support Canada's music industry. AEMCON has broken down its workshops and master classes into six main sectors. Attend as many panels, workshops and performances as you would like, all included in your conference pass. After a day of active learning, your conference pass gains you access to the many performances taking place at Habitat, HIFI, Commonwealth, Broken City; to name a few. A great time to unwind and catch many of the artists performing over the four days. There is an abundant opportunity to learn and grow at AEMCON this year, take advantage of this event. If you can not make the full conference/festival, make it out for a day or two.Full conference and festival pass cost $179.99 in advance $189.99 at the door. They are well worth the price, with a full daily itinerary and night time shows there is much to choose from. A student full conference/festival pass is $150. Single day pass or a night time only passport ranges from $79-$99.99. See the link below for tickets and schedule.